I’m sure you know as well as I do that having kids can mean trying to pinch pennies everywhere, and starting to really think about eating healthy while doing it. That’s why knowing a few simple toddler finger food recipes can really help you do both, you probably want to stay away from fermented foods for this and keep this great recipes with it for adults. You don’t want to spend like $5 a box for high fructose syrup-filled snacks that will only last you an outing. You want to spend $5 and really see that money stretch! So here are a few toddler finger food recipes or even simple finger food combos that have come in handy for me. They’re also perfect for keeping my toddler busy with his hands to himself while I’m trying to run errands. Just make sure you keep baby wipes handy, and that you watch your toddler. Also please keep in mind that some of these recipes are thought out for older toddlers, so if some of these recipes seem to be yet too risky for your little one’s eating experience, just wait till they’re a bit older! Crisp Rice and Craisin Clusters – A 12 oz box of crisp rice cereal will take you a long way when making toddler finger foods. You’ll need 4 cups of miniature marshmallows, 3 table spoons of butter, and 6 cups of crisp rice cereal, and one cup of craisins (dried cranberries). Before you begin, put wax paper inside a glass bowl so that it lines the inside of it to prevent sticking. Then, melt butter in a 4 qt. dutch oven pan, then melt the miniature marshmallows, and then pour in all the crisp rice. Mix well until the marshmellows are adequately distributed so that all the crisp rice is in clumps. Then add in about a cup of craisins (dried cranberries). Mix that well. Then, instead of putting the sticky goodness in a pan, pinch out little clusters with your hands, making sure each cluster gets a bit of craisins, about the size of a popcorn, and then pinch the clusters together so they they stick. Place the clusters in the bowl one by one, making sure that they don’t get smooshed together. Once they are cooled, you can separate smaller portions into little sandwich baggies to take with you wherever you go! Cinnamon Apple Slices – Peel a granny smith apple, and then cut it into slices as you normally would. Then, cut those pieces of apple into about three thin slices each. Follow this by simply spreading honey on each side of the apple slice, and then sprinkling it with cinnamon. Voila! You have an easy finger food snack! Sweet Pops of Corn – Don’t pump your kids with hydrogenated oils by feeding them popcorn from the bag. Buy unseasoned, unsalted, unpopped kernels and pop them yourself. Then, take a 4 qt. dutch oven sauce pan and pour extra light olive oil or sesame seed oil or vegetable oil up to about a 1/4 inch deep. Heat on medium heat until oil starts to sizzle lightly. Pour in about 3 tbsp. of honey, 3 tbsp on peanut butter, and 3 tbsp of butter and melt them. Then, pour in kernels so that you have one dense, single layer of them. Continuously mix them with a wooden spoon until they start to pop. Once they start to pop, you can cover the pan with a lid and continuously shake it, until you start hearing the popcorn pop profusely. At that point you can turn off the heat and have delicious, sweet popcorn. Chex Treats – Get 1/3 cup Smart Balance olive oil butter substitute, 1/2 tsp of vanilla, 2 cups of marshmallows, annd 4 cups of Chex. Melt butter, then add marshmallows, then add vanilla, and then add 1 tsp water just to thin it out. Then, add the Chex. 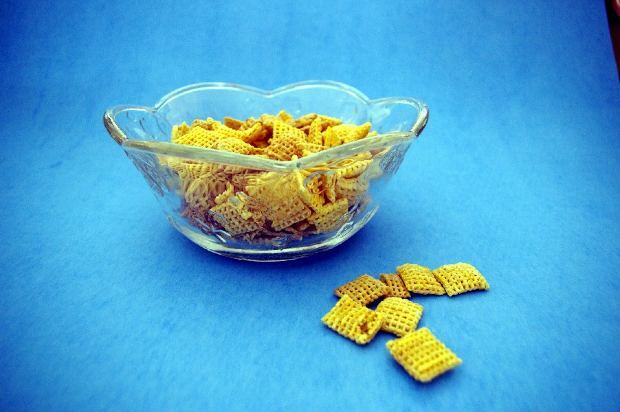 You can crumble the Chex or leave them whole. Then put the Chex in a bowl that is lined with parchment paper, and put it in the freezer to cool for about 5 mins. Once that is hardened, pull into small little clusters that are manageable for your toddler. At the end, you can coat the tops of them with peanut butter or drizzle chocolate syrup on top. Healthy peanut butter sandwich strips – If your toddler’s little hands are as tiny as my toddler’s hands, cutting a simple peanut butter sandwich into individual strips can make a very simple and not-so-messy finger food snack. Simply use organic peanut butter and organic jelly, and spread it on wheat bread. Then cut off the crust and cut the sandwich 4 times long-wise, and once sideways to make small little pieces that will be easy for your toddler to handle. Barilla Piccolini – Barilla makes tiny pastas that are perfect for your toddler. They come in five shapes: Mini Farfalle, Mini Penne, Mini Wheels, Mini Fusilli and Mini Ziti. Simply pick up a box and cook about a fourth at a time if you’re just trying to achieve a snack. Cook them according to the box’s indication, and when you drain them, make sure to keep about a 1/4 of a cup of the boiling water to pour back into the bowl once the pasta is drained. This will keep it from getting dry. Then, get about 1/4 cup of peas from a canned pea can and stir together, but be sure not to mach up the peas. Add a little bit of Parmesan on top. Your toddler will love it, while sneaking in some veggies! These extremely easy recipes are bound to save you money and diminish the amount of processed food that enters into your toddler’s little tummy. But keep your toddlers safe by monitoring them while they eat any of these tasty toddler finger food recipes!